At Spotlight Signs, we have years of experience working with a great number of firms in a variety of industries. Depending on its unique brand and particular industry, the signage needs of each of our customers will vary significantly. It is our expertise and commitment to our customers that allows us to take the time needed to determine the signage solutions that best fits our client’s situation. One area that we have extensive experience in is in signage for law firms. We have worked with a number of them over the years and have come to understand what matters most in that industry. Beyond all else, people are looking for legal representation that they can trust. Considering this fundamental fact, it is important that law firm signage exudes competence, strength, and loyalty. Recently, we have completed a few signage projects at the office of Bruno Gitnacht. These join many others that we have completed for law firms in Phoenix, Mesa, Gilbert, Tempe, Scottsdale, and Chandler, AZ. Law Office of Bruno Gitnacht, P.L.L.C. The Law Office of Bruno Gitnacht P.L.L.C. is located in downtown Phoenix. 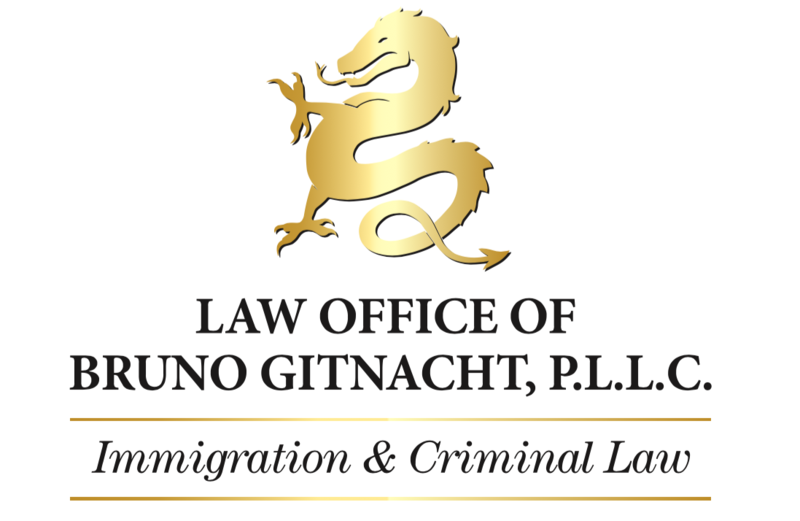 Lawyer Bruno Gitnacht specializes in criminal defense and immigration law and thus performs a critical service to our society. He is fighting an uphill battle to keep the government in check and protect the people of his community. His brand reflects tenacity and elegance in its simplicity and its utilization of a dragon silhouette. Recently, Bruno Gitnacht came to us with a vision for a new lobby sign and a building sign. As with all lobby signs, he wanted his to leave a good impression on visitors to his office. We worked closely with his team to design and fabricate a sign that expressed his brand faithfully and effectively. To achieve this, we used dimensional letters and a dimensional dragon mounted to an acrylic panel that we covered with etched glass vinyl. As in all industries, street signage for law firms should clearly and plainly communicate the location of your business. In this case, it was important that we use large enough text and imagery that the sign could be legible from across the street. In all street signage projects, it is important to keep in mind the distance from which the sign is visible, and that was a major component in this project. This acrylic panel was formerly one with tracks that held removable letters. We utilized the existing frame, but installed a much more modern sign, also mounted on white acrylic with colored vinyl letters and numbers. We have helped a number of other law firms with signage projects, ranging from dimensional letter building signs, lobby signs, window graphics, and much more. Law graphics tend to favor a more understated, professional brand. It is important that people feel they are in good hands when seeking legal counsel, and although they may not realize it, signage can go a long way in making them feel that way.